Model based testing tools refer to the software testing technique which is used to generate test cases from the model which describes the functional aspects of the system which are under test. Model based testing technique is mostly adopted as an integrated part of the testing process. Apart from this, model based testing tool is used to generate tests that includes both offline and online testing. The global model based testing tools market is expected to expand at a significant CAGR over the forecast period i.e. 2018-2027. Factor such as increasing model based development process in the developing regions is expected to drive the growth of global model based testing tools market over the forecast period. The market is segmented in five major regions including North America, Asia Pacific, Europe, Middle East & Africa and Latin America regions. Among these regions, North America is projected to dominate the overall market of model based testing tools during the forecast period. Factor such as advancement in software based testing techniques is expected to positively impact the growth of model based testing tools market over the forecast period. Europe model based testing tools market is poised to grow at a significant rate over the upcoming years. 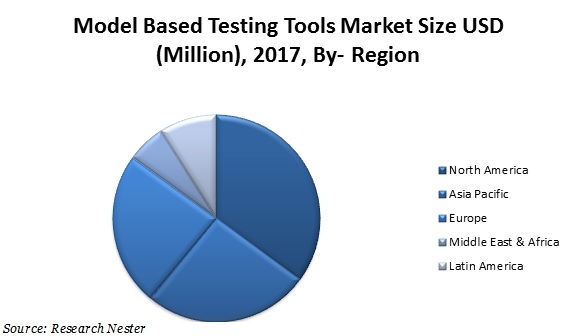 Presence of few world leading technology companies in the region is fostering the growth of model based testing tools market over the forecast period. Asia Pacific region is expected to observe outstanding growth in the upcoming years. Increasing automobile manufacturing base and large IT industry that requires software testing is anticipated to drive the growth of model based testing tools market over the upcoming years. Factor such as increasing software based solutions across the globe is anticipated to intensify the growth of global model based testing tools market over the forecast period. Apart from this, acceptance of efficient method for testing using the model based testing tool is expected to increase the growth of global model based testing tools market over the forecast period. In addition, the adoption of model based testing tools technique such as open source model based testing tools and other such techniques are increasing over the developed regions. This factor is anticipated to positively impact the growth of the global model based testing tools market over the forecast period. Further, rising advancement in model based testing tool for various industries such as automotive and others is likely to further strengthen the growth of global model based testing tools market over the forecast period. Moreover, outdated manual testing procedure and other complex testing structures are expected to robust the growth of the global model based testing tools market over the forecast period. However, complexity of the model based testing tool and lack of skilled operators are some of the key factors which are expected to limit the growth of global model based testing tools market over the forecast period.